Well it is here the last day of my 7 days of Halloween. It has been such a treat to share so many fun projects in a row with you guys. I will still have other videos and posts throughout the month, but these 7 days were just to help get those creative juices pumping. For today’s share I took a Dollar Tree creepy skull and turned it into a sugar skull. It was very simple and a great project. If you are having a party and want a fun craft project this would be it. With just a little prep work everyone would leave with a project they love and can keep in their Halloween collection. Grab a box and mask and in a well-ventilated area spray your sugar skull, give it one coat and walk away for an hour or so, come back and give it a second coat to get the base and areas you missed. I think for my one skull I may have used what feels like a 1/4 of the spray can. *Note: it is a good idea to give the skull a bit of a rub with the sandpaper first to help the spray paint stick. 3. I looked online to get an idea of colors/patterns I may like to incorporate into my skull. 4. I used black acrylic paint to do the outlines of all the shapes I wanted. I colored the eye sockets in black, the nostril area in black. I did black lines around the teeth, then added my shapes around the skull. 5. I then used the black lines as paint by number and picked four of my favorite colors and began filling in all the shapes. 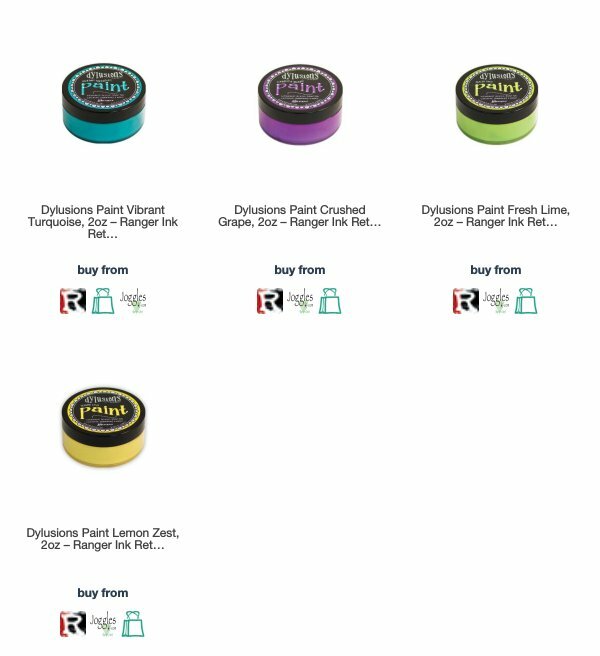 I chose Dylusions paints because of their vibrancy and they worked really well over the spray paint. 6. The acrylic dries very quickly making for an easy make and take craft project. Alright, folks, it’s time to stock up on those Dollar Tree Skulls before they are gone for the season. You can also paint your skull black and use bright colors if you like using the sticky jewels you can make a bedazzled skull, there are just so many options with a little spray paint and imagination. Thanks for joining me for my 7 days of Halloween! Happy crafting!